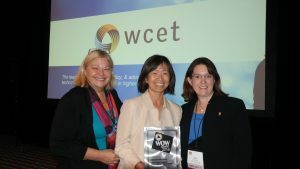 Academic Technologies Director, Hae Okimoto, on behalf of the UH System, received the WOW (WCET Outstanding Work) Award for “Using Analytics to Transform Decision-Making for Student Success” at the WCET annual meeting in Minneapolis, MN. WCET is a leader in the practice, policy, and advocacy of technology enhanced learning in higher education. The annual meeting brings together thinkers, practitioners, and leaders in higher education who use technology to positively impact education.